Money Market Tips: share market--How do you see the stock of Ashok Leyland in coming years after the resignation of Vinod Dasari, its CEO and MD? share market--How do you see the stock of Ashok Leyland in coming years after the resignation of Vinod Dasari, its CEO and MD? Many Companies go through many transitional phases in their life cycle- while some transitions might be on strategy, some transitions would be related to growth, some related to mgmt change etc. 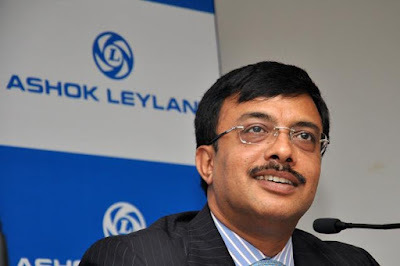 Ashok Leyland has got into a transitional phase, with the current MD & CEO, Mr. Vinod Dasari resigning for pursuing other interests, after a 14 year stint - first 7 years as COO and next 7 years as MD & CEO. This is not the first time that has happened to an Company in India and in the 14 months itself, there have been many high profile exits. Take the case of Infosys CEO, Dr. Vishal Sikka quitting in Aug 2017. What happened then ? The stock tanked by 13% and post damage control, with some quick organizational adjustment, the stock recovered and has participated well in the IT rally over the last 1 yr. With Mr. Nilekani well versed with Infosys, the Company was reset onto the right track. Another example: Take the case of Interglobe Aviation or Indigo. The Co. President Mr. Aditya Ghosh resigned on Apr 26th 2018. What happened then ? The stock tanked 6.3% but at the same time no credible person was appointed in his place. Also, the crude oil prices started rising along with rupee depreciating rapidly and, with the company also getting its planes grounded due to NEO 320 engine issues, the stock under performed for almost 5 months. Now, with crude falling and rupee stabilizing the stock is recovering a bit. So, what is it with Ashok Leyland? · When Dasari took over, the company’s vehicles sales were 101,990 in 2011-12 (he took over as MD on April 1, 2011) and in 2017-18 they stood at 174,873 units. · The firm’s profit was Rs 565 million, which increased to Rs 15.62 billion in 2017-18. Market share rose to 35%. · Besides building the core business, which is medium and heavy commercial vehicles (M&HCV), he also built the adjacent areas — defence, light commerce vehicles, spare, and others — as part of de-risking strategies. · Today, M&HCV’s contribution is less than 60% as compared to 80%, as other businesses have grown. · During Dasari’s tenure, the company exited from some of the joint ventures including with Nissan and John Deere. · While in the LCV (with Nissan), the company decided to go solo and has also exited the construction business completely. · He has never advocated for discounts to gain market share and has ensured that the profitability remained good. · He helped improve quality, reliability to such an extent that in a new business like Defence, they have won 31 orders in 3 years ,basically, they won every tender they bid for. · On the EV front, they made huge strides, with the electric vehicle plant ready in Chennai and the first batch of vehicles getting ready to run in Gujarat by Jan 2019. · The company is ready to launch BSVI compliant vehicles faster than other manufacturers. What next for Ashok Leyland? Once the new CEO is appointed then there will a minor transition period where the capability will be assessed as analysts, investors etc trying to get a feel of the new appointee. The good part is that the CFO, Mr. Gopal Mahadevan is a very capable leader, team member and can support the CEO in a quick transition, in getting to know the nitty-gritty of the business, segments etc. Having worked with Mr. Mahadevan earlier in Thermax (he was the CFO when I was the Executive Assistant to Chairperson of Thermax), I am sure that he will do much more than required in getting through this short phase. Regarding business verticals, the company is on solid footing, with product & service verticals running on process oriented systems and contributing sufficiently. The operating margins are decent at 10.6% and might see a spread of 60 -80 bps due to competition, raw material costs, demand slow down arising from liquidity and regulatory issues. I expect this phase to last anywhere between 6–9 mths, post which we could see an excellent revival in the auto sector, well supported by export growth. Over the last 5 years, Ashok Leyland has done well in an operational turnaround, market share, profitability, segments, pan India presence etc which has reflected well in its stock returns, out performing the Auto Index and Nifty50 also. Hence, the Company is secured on the business front. The next thing that needs to be seen is who will be appointed as the new CEO? Will he be from the auto industry? Will he be sufficiently experienced in CV strategy, have an understanding of defence equipment, will he have a global exposure to increase exports? These would be the main questions facing the Company, investors, analysts over the next few months till a new CEO is appointed. Based on that, post a short transitional phase, we should get to understand the direction of the company - either upward or downward. Till then, I will keep my fingers crossed (hold my shares as is)!